I am running out the door this morning so it will be one of those drive by postings. This lovely little gal is from Mo's Digital Pencil and she is called Spring For Sale. 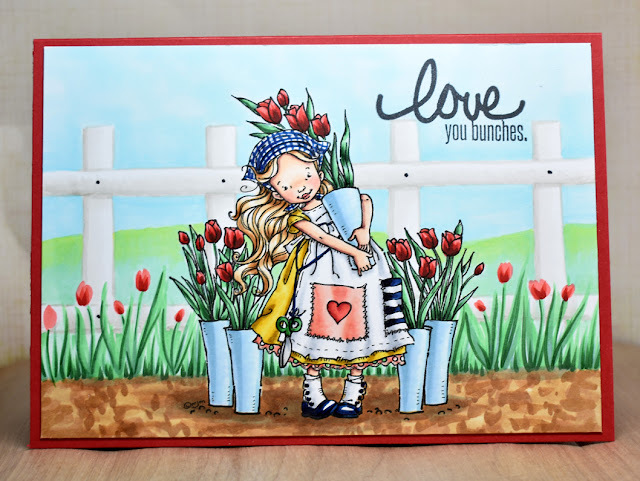 After a week of rainy weather we are finally seeing real signs of spring around here like tulips and daffodils blooming and bobbing in the breeze so this gal was really calling me to get on a card. I sketched in a simple pastoral scene for her to live in and really wish that I could join her, LOL! Alrighty, I really gotta go. See ya tomorrow with TGF April release previews! You’ve been doing your own awesome backgrounds rather than printed papers. So lovely. Such talent. Hugs.